This group brings together João Alexandre (on the guitar) and André Calvário (on the bass) - who are two regulars of the experimental music scene in Lisbon - and Jam With Humans director Daniel Matias Ferrer (on the drums). They will bring in a mix of improvised progressive rock and free jazz. This collaboration was destiled in an album, also featuring two other musicians on voice and guitar, which will be released in the Jam With Humans Fest. As usual, the regulars participants of the Jam With Humans workshops will be joined by the guests musicians to show the music they've been working on together. Expect a more refined and condensed version of the Invasion! show, presented last December in Zaal 100. For the closing act, an improvisation game where two musicians at a time are randomly picked and will improvise together in a duo. This will feature a few guest musicians and the most courageous members of the Jam With Humans Orchestra. 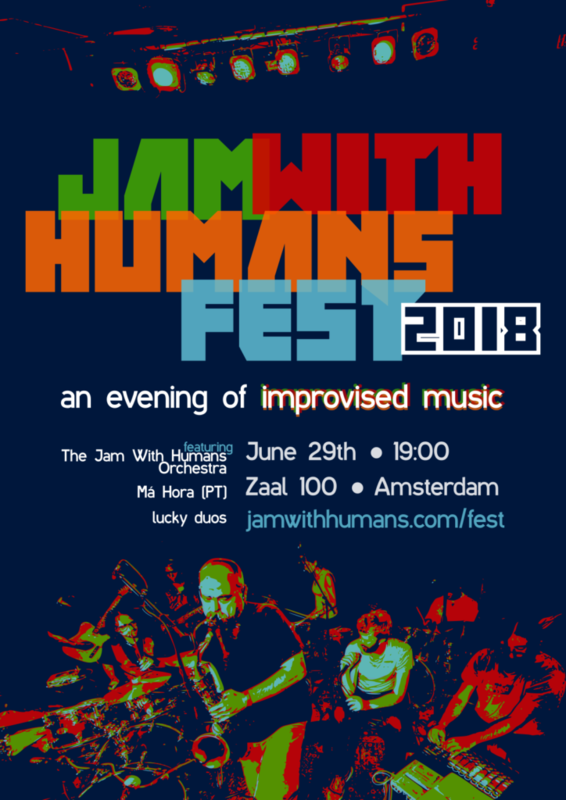 @ https://jamswithhumans.com you can get tickets for 5,00 euro!